All WEST SYSTEM Epoxy Boat Repair Kits contain the same high-quality epoxy products as our larger packaging. Designed with convenience in mind, these kits contain enough epoxy products the right application tools to complete small repairs on the go, along with thoughtful, illustrated instructions. They’re perfect for storing on your boat or RV in case of emergency, and handy to have around for when the marine chandler or hardware store is closed. Whether you’ve got a fiberglass boat, an aluminum boat, a plastic boat, you’ll find WEST SYSTEM epoxy repair kits are convenient and indispensable. The 105 K Fiberglass Boat Repair kit contains enough epoxy, fiberglass, and fillers to complete repairs to cracks and holes, gelcoat blisters, delaminated cored panels and more. Detailed instructions show users how to do it right. 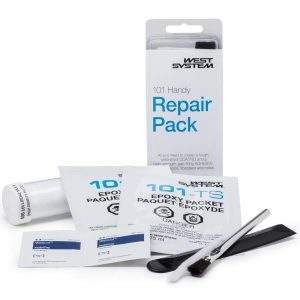 Fiberglass Boat Repair Kits contain 8 pre-measured packets of WEST SYSTEM 105 Resin and 205 Hardener, fiberglass fabric, adhesive filler, fairing filler, glue brushes, mixing pots, a mixing stick, an application syringe, three pairs of disposable gloves and illustrated instructions for completing a variety of common fiberglass repairs. All components are contained in a sturdy, resealable package that can be easily stowed aboard your fiberglass boat. The 655-K Plastic Boat Repair Kit is designed for making repairs to plastic canoes, kayaks, and inflatables—whether they’re made from HDPE, LDPE, ABS, PVC or polycarbonate plastic—just got a little bit easier. Plastic Boat Repair Kits features plastic-friendly G/flex 655 toughened epoxy. These kits contain 8.4 ounces of pre-thickened G/flex epoxy, protective gloves, mixing pallets and mixing sticks. Illustrated, detailed instructions explain how to repair splits and cracks in plastic boats, attach or repair reinforcement points on inflatable boats and repair pinhole leaks in inflatables. All components are contained in a sturdy, resealable package you can store on your plastic boat. The 650-K Aluminum Boat Repair Kit is perfect for permanently sealing leaky seams and rivets, the most common problem on aluminum boats. Aluminum Boat Repair Kits contains 8 ounces of G/flex 650 toughened epoxy, adhesive filler, application syringes, mixing pots and sticks and protective gloves. Illustrated, detailed instructions explain how to repair leaking seams and rivets in aluminum boats. All components are contained in a sturdy, resealable package you can store on your aluminum boat. WEST SYSTEM’s original repair kit contains 6 pre-measured packets of 105 Resin/205 Hardener, filler and mixing tools. Super convenient for making small repairs just about anywhere. Read about how a WEST SYSTEM G/flex repair kit saved the race for a skipper whose C&C 41 sustained rudder damage during the Bermuda One-Two offshore.